“Water, water everywhere, nor any drop to drink.” In Samuel Taylor Coleridge’s famous poem The Rime of the Ancient Mariner, a sailor finds himself trapped in the middle of the ocean, dehydrated and surrounded by useless salt water. Today, we are faced with a similar problem globally: while about 71 percent of the Earth is covered by water, there is a troublesome mismatch between where water is and where it’s needed. The effects of water scarcity can be catastrophic – so much so that, since 2012, the World Economic Forum has rated water crises among its top three global risks in terms of impact, ranking them alongside weapons of mass destruction, climate change and the outbreak of infectious disease. The threat of scarcity is a growing one, exacerbated by an expanding population and developing countries forming consumption habits in line with those the western world has set. The UN’s 2017 World Water Development Report (WWD report) projects that demand will increase by approximately 55 percent by 2050, driven by a 60 percent global increase in food demand, along with a 400 percent increase in demand for water in manufacturing from developed countries. Climate change also alters water cycles, causing droughts and famine. If left unchecked, the growing competition for water resources will lead to mass migration, escalating political tensions and massive upheaval in industry. The severity of global water scarcity was brought into sharp focus by a paper published last year by researchers at the University of Twente. Their findings were bleak: around four billion people, almost two thirds of the world’s population, experience severe water scarcity for at least one month of the year, with roughly half a billion living with constant water scarcity. Analysis of data collected over the past 60 years is now underway to determine whether demographic shifts in recent decades have compounded the problem. The causes of increasing water scarcity are varied, and while it is tempting to chalk the problem up to yet another unpleasant facet of climate change, Hogeboom stressed that warming temperatures are only part of the story. “The drivers are mainly an increase in population, since population grows quicker than climate change. But also as living standards improve, the consumption patterns of people change. As people become more affluent they have changing diets, and the expansion of aggregated agriculture is a big water demand driver,” he said. The problem is made worse, Hogeboom explained, by communities importing more food and depending less on their immediate environment for resources. “That’s more or less coupled with when global trade emerged,” he added. While many countries have so far avoided the grave effects of water shortages, the acceleration of scarcity means this will not remain the case for much longer. The severity of a water disaster is largely due to water’s necessity for basic survival, but it also runs through the core of economic prosperity – a link that was explored in the 2016 edition of the WWD report. The report found that a sizeable chunk of the global economy is threatened by scarcity, with almost 80 percent of the world’s population employed in jobs that depend on water. Growing competition between water users and water uses will lead to uncomfortable questions about how water is allocated. One industry that will come under scrutiny is power generation since, as Hogeboom pointed out, the water footprint of electricity varies considerably by production method. “The International Energy Agency drafts these policies that are focused on reducing CO2, but they don’t look at water at all. Even though with hydropower, for example, you have a big loss in terms of evaporation from the reservoir. Biomass may also be one of the so-called green sources of energy, but it will have to compete with food production, so I don’t see much future there,” he said. Worse still, according to Hogeboom, pressure on water resources will not only lead to competition between humans and industry, but also among countries. 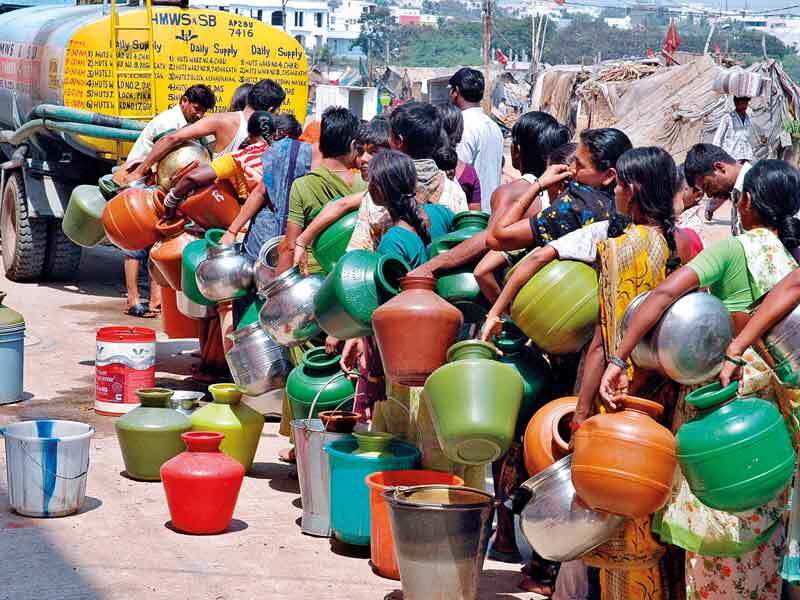 Like many environmental issues, the causes and consequences of water scarcity are not shared equally: while the water-intensive consumption of rich countries creates much of the problem, the results will be worst-felt in developing economies. The WWD report cites vulnerable hotspots of water-related stress in countries throughout Africa, Latin America and the Middle East and describes how the effects can already be seen in the Arab region, where unemployment trends have worsened as a result of low agricultural yields. However, this does not mean rich countries will escape unscathed, since they also face a raft of problems in the form of creaking infrastructure buckling under the pressure of sprawling urban populations. Investing in water: Comparing utility finances and economic concerns across US cities, a recent report authored by Joseph Kane, an associate fellow at the Brookings Institution, examines the water challenges faced by wealthy countries in the context of the US. In an interview with World Finance, Kane described how, despite being one of the richest nations on Earth, the US has failed to keep pace with water infrastructure investment. Renovating sewage infrastructure may not be the most glamorous political campaign promise, but scrimping can prove extremely costly, as was grimly demonstrated when the lead poisoning scandal unfolded in Flint, Michigan in early 2016. A toxic combination of ancient pipes and untreated water caused lead to seep into the water supply of more than 100,00 residents, including almost 12,000 children, in a grisly reminder that it does not pay to ignore water infrastructure. infrastructure will crack under the strain. Globally, a funding injection is needed to overhaul infrastructure and partly solve the shortage issue by making better use of wastewater. The 2017 WWD report is devoted entirely to the issue of wastewater and highlights its potential use as a freshwater alternative in manufacturing, but also details the significant work this will require. The report estimates that while high-income countries treat 70 percent of wastewater, this drops dramatically in less wealthy countries. In upper and lower middle-income countries, only around 38 percent and 28 percent respectively is treated. Worse still, in the poorest countries, the figure stands at about eight percent, with the rest released back into the environment as raw sewage. While rich countries may treat wastewater more effectively, they are guilty of plenty of needless waste, as Hogeboom pointed out: “We’re wasting a lot of water in agriculture. By simply using more efficient irrigation strategies, we can reduce many of the problems we have. The water infrastructure in rich countries is also often decades old, and funding costly renovations has proved difficult. This problem is acute in the US where, according to Kane, the responsibility for financing sewage systems falls mostly to governments at state level. Under tight budget constraints, governments are forced to radically rethink funding options, and charging more for water services is simply not a viable solution, according to Kane: “Certain water utilities, for example in Washington DC, San Francisco or Philadelphia, are experimenting with new ways of setting rates, in lieu of any federal leadership. While smart sensors may help save some money by allowing authorities to foresee future issues rather than dealing with the expensive results of a crisis in hindsight, the gap in funding remains and may have to be plugged, in part, by the private sector. Investors are already circling over the profits to be made from water scarcity, with funds that bet on the cost of materials in water-dependent industries already cropping up. While many of these funds invest globally, the scarcity issue in the US is such that the largest of these, the PowerShares Water Resource Portfolio, with over $804m assets under management, is US-focused. However, infrastructure investment may prove less attractive, according to Kane: “The challenge is where is there going to be a durable financial return for a private sector entity, given the fact that many localities are already struggling to increase the rates that they’re charging their customers. The water shortage problem may be stemmed for a few generations if global industry can adapt to using wastewater, but in the meantime this solution and the finance to implement it seem oceans apart.